When you set up Amazon Pay and Login with Amazon, your customers can log in with their Amazon credentials, and use any payment methods or contact information they have stored in their Amazon account in order to make purchases on your site. You can start the registration and configuration process for Amazon Pay and Login with Amazon from the Magento administrative pages. Click the My account is ready, I need to connect it to Magento button. A popup window will open to start the registration process. Choose the Existing merchant account option, and sign in to your account. Complete the remaining registration pages. Depending on your registration status, you may see a few extra pages. When the registration has been completed, you will be directed to connect your merchant account to Magento. Choose the Transfer access keys to Magento option to initiate the key transfer process. You will see a success page, and you can close the popup window following this screen. You will see an error page. Follow the instructions on the page to copy the credentials, and then manually upload them to the Magento administration page. To upload the credentials, go to the Credentials > Import From Clipboard text area, paste the content of the clipboard, and click Save. When the key transfer is complete, the keys will be automatically loaded into the Seller/Merchant ID, Client ID, Client Secret, API Access Key ID, and API Secret Key fields in the plugin. The plugin will be enabled by default. To turn it off, choose No from the Enabled drop-down list. Click the Get started with account registration button. A popup window will open to start the registration process. If you use other Amazon Seller Services, choose the Existing merchant account option, and sign in to your account. 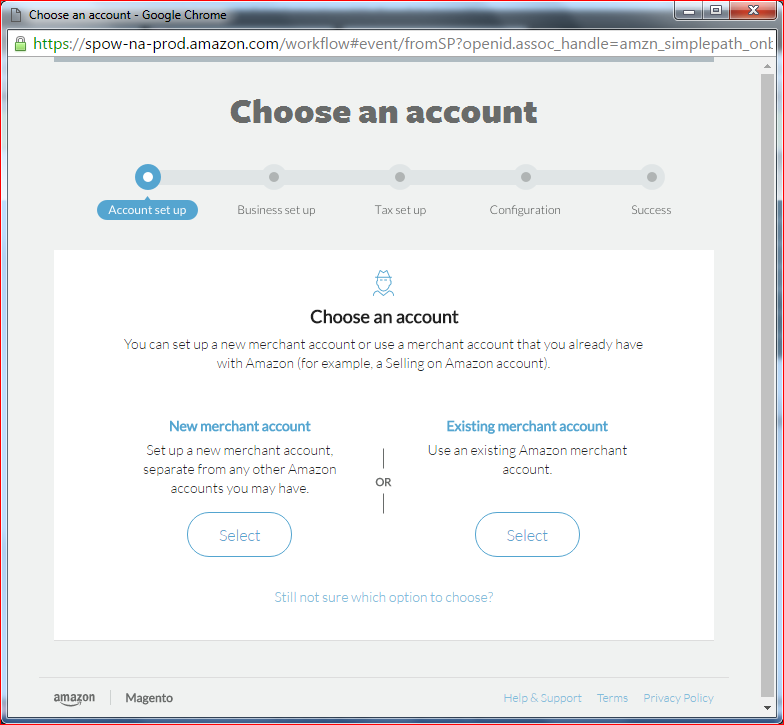 If you are new to Amazon Seller Services, choose the New merchant account option. Complete the registration process by filling in business, tax, and configuration details. When the registration is completed, you will be directed to connect your merchant account to Magento. 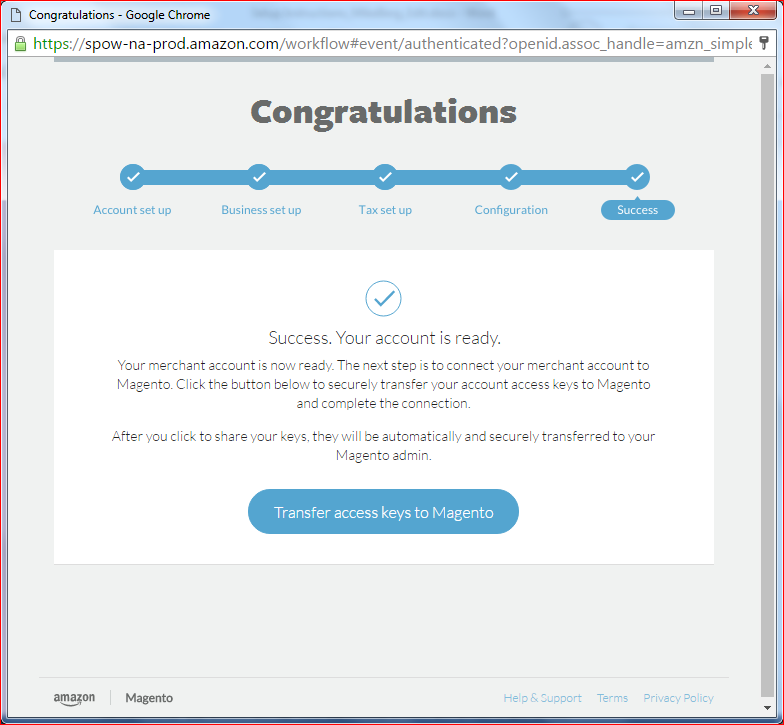 Choose the Transfer access keys to Magento option to initiate the key transfer process. Magento Core OnePage Checkout — Select this option if you are using the standard accordion-style checkout that ships with Magento. The extension integrates seamlessly, using your existing CSS, but replaces the shipping info, billing info, and payments panes with the Amazon address book widget and wallet widget integrated into the layout. Amazon Standalone Checkout — Select this option if you are using a non-standard checkout or one of the checkout extensions for Magento such as onestepcheckout. This will create a dedicated /amazonpayments checkout page in the body section of checkout (retaining your site's header, footer, and styles). This page can be themed as needed. 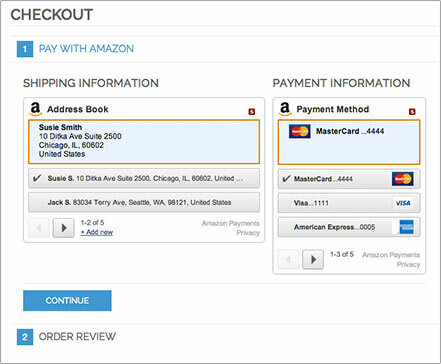 When a customer chooses to use Amazon Pay, they are taken to this Amazon checkout page, where they can see their Amazon address book, wallet, and the order summary. Amazon Standalone Checkout in a Modal Window — Select this option to provide the same customer experience as above, but with the checkout page in a modal overlay window, instead of a standalone page. Authorize & Capture — Select this option to collect the payment immediately upon receipt of the order. Authorize Only — Select this option if you want to authorize the payment only when the order is received. This is a useful for custom orders or other orders that might take a long time to fulfill, because you might want to wait to complete the payment until the order is complete. You can choose to run Amazon Pay in Sandbox Mode by selecting Yes from this drop-down. Sandbox mode allows you to test the extension without having to worry about any live transactions. You can choose to run Amazon Pay in Debug Mode by selecting Yes from the AUTHORIZATION SANDBOX SIMULATION drop-down. Debug mode does a couple of things. It logs any API errors in your Magento log, so you can review them later. 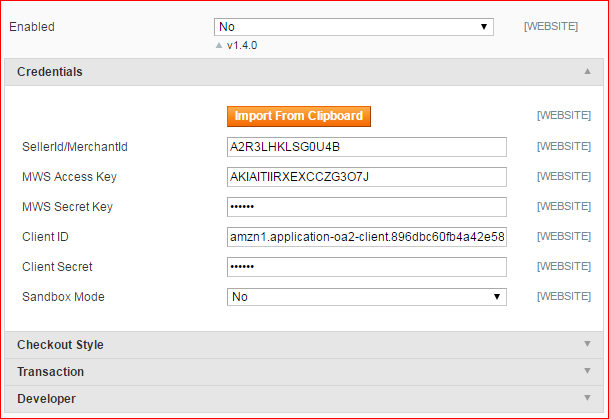 It also creates an Authorization Sandbox Simulation box (see image) to your checkout screen. This allows you to run additional tests on the extension. Note: For more details on how to run simulations, see Testing Your Integration in the Sandbox Environment in the Amazon Pay and Login with Amazon integration guide. When you have completed every field, click the Save Config button at the top of the screen. The extension should be ready to go. Note: Because the extension creates a Magento account for users when they use their Login with Amazon credentials, the automatic new account email will be sent, as usual. If you do not want to confuse your customers by sending multiple emails, you may want to edit or disable that email from the System > Transactional Emails menu.